Calling all descendants from Ottawa, Osgoode, North Gower, Renfrew ON and Quyon, QC of the O’Connor, Doyle, Dolan, Killeen, Kilby, O’Callaghan, Cadieux, Frood, Wilson and McEwan families !! The details are set for our first Reunion! .. and you’re invited to join us! We would love to rekindle friendships from years past .. and make new friendships with our relations we haven’t met from the Ottawa area. For more details, and a map, check the Reunion 2011! page. For those who want to stay over at the hotel, Country Inn & Suites details are on the Reunion page. The first European to reach the area of what is today Montreal was Jacques Cartier, on October 2, 1535. Cartier visited the villages of Hochelaga and Stadacona, and noted others in the valley which he did not name. He recorded about 200 words of the people’s language. Seventy years after Cartier, explorer Samuel de Champlain went to Hochelaga, but the village no longer existed, nor was there sign of any human habitation in the valley. Champlain decided to establish a fur trading post at Place Royal on the Island of Montreal, but the Mohawk, based mostly in present-day New York, successfully defended what had by 1605 become their hunting grounds and paths for their war parties. It was not until 1639 that the French created a permanent settlement on the Island of Montreal. Paul Chomedey de Maisonneuve, Jeanne Mance and a few French colonists set up an outpost named Ville-Marie on May 17, 1642. A decade later, Ville-Marie had been reduced to less than 50 inhabitants by repeated attacks by the Mohawk. So in 1651, Maisonneuve returned to France to recruit at least 100 men to bolster the failing colony. He had already decided that should he fail, he would abandon Ville-Marie and move the remaining residents back downriver to Quebec City. The fruit of Maisonneuve’s recruiting efforts was the ship that sailed from Nantes in the Loire Valley and arrived at Ville-Marie on 16 November 1653. Among the 140 on board were Marguerite Bourgeoys — later a nun and foundress of the Congrégation de Notre-Dame, and one of Canada’s first saints — and a young man, Jean Cadieu, the first of our Cadieux ancestors to arrive in North America! 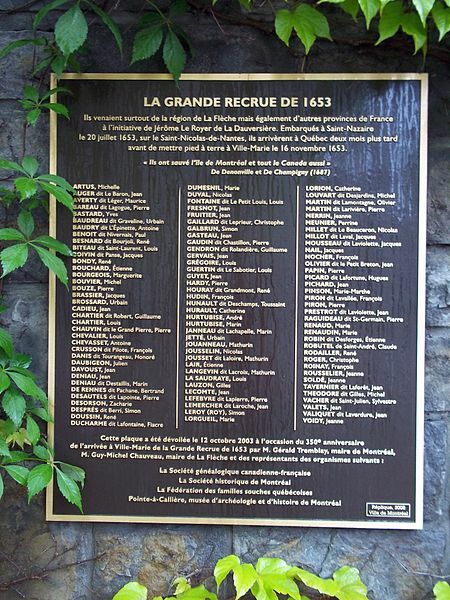 The effort to save Ville-Marie — Montreal — was so important, and essentially guaranteed the future of Ville Marie and of all of New France, that it is known in Montreal’s history as “la Grande Recrue” and commemorated with plaques listing the colonists in both Montreal and Nantes.